Note that he is the father of A. E. Becquerel, and the grandfather of Henri Becquerel. Antoine César Becquerel (March 7, 1788 – January 18, 1878) was a French scientist and a pioneer in the study of electric and luminescent phenomena. In biochemistry he worked at the problems of animal heat and at the phenomena accompanying the growth of plants, and he also devoted much time to meteorological questions and observations. 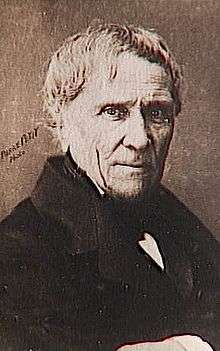 He was a prolific writer, his books including Traité de l'électricité et du magnétisme (1834–1840), Traité de physique dans ses rapports avec la chimie (1842), Elements de électro-chimie (1843), Traité complet du magnétisme (1845), Elements de physique terrestre et de meteorologié (1847), and Des climats et de l'influence qu'exercent les sols boisés et non boisés (1853). He died in Paris, where from 1837 he had been professor of physics at the Museum d'Histoire Naturelle. ↑ "Antoine César Becquerel (1788 - 1878)". Royal Netherlands Academy of Arts and Sciences. Retrieved 29 January 2016. This article incorporates text from a publication now in the public domain: Chisholm, Hugh, ed. (1911). "Becquerel". Encyclopædia Britannica. 3 (11th ed.). Cambridge University Press.